This characterful 16th century (or earlier) detached cottage is in the heart of Stoke, a small hamlet on the road leading from Hartland to Hartland Quay, in one of the most unspoilt parts of England. In the early 18th century it was, for a short time, a hostelry when Hartland Quay Inn had its licence withdrawn for rowdy and drunken behaviour! The hamlet of Stoke consists of a few cottages and the beautiful church of St Nectan, called ‘The Cathedral of North Devon’ due to its huge size and tall tower, once used by wreckers to entice ships onto the rocky shore whose captains believed it to be the lighthouse! Beautiful walks and bicycle rides along the small lanes, with fabulous views of the Atlantic, start from the doorstep. Access to the South West Coastal Footpath is about 10 minutes walk from the cottage, from the path starting in the churchyard, 200 yards from the cottage. The Bear is part of the Hartland Abbey Estate which lies 3 miles south of Hartland Point. The Bear has been extensively renovated to provide comfortable accommodation all year round. Guests are able to enjoy the stunning coastline with its huge cliffs, sandy beaches, rocky coves and views to Lundy Island. Surfers enjoy the big rollers at Hartland Quay and other coves nearby and there are plenty of beaches suitable for children within a short distance. Hartland(1m) has very good small shops, fresh fish nearby, and we do ask guests to support local stores wherever possible. On booking we send guests a list of local shops, pubs, restaurants, attractions etc. Hartland Quay(1/2m) has a good pub overlooking the Atlantic which is great fun for lunch or in the evening. Historic Hartland Abbey is close by; Clovelly is only 5 miles away with its cobbled street, donkeys and lovely harbour. Double room with kingsize double bed, ensuite shower, w.c. and handbasin. 2 twin bedded rooms, 1 family bathroom with bath. w.c., handbasin. The slate floored entrance hall leads into panelled inner hall. Half panelled sitting room with large open fireplace with woodburner, TV and DVD. V. small children’s nursery or study. 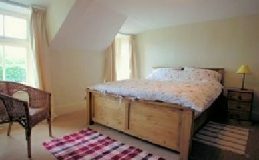 Half panelled double bedroom with kingsize double bed. Bathroom with shower, w.c., handbasin. Kitchen equipped for 8 people with Rangemaster electric cooker, double sink overlooking garden, dishwasher, microwave, fridge freezer, pine table with seating for 8. Back door utility area with washing machine and tumble dryer, hanging for wet clothes, gumboots,wetsuits etc. WiFi within the cottage. 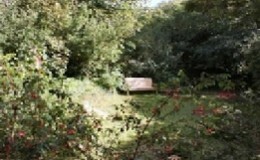 Grassed garden with outdoor seating for 8. Off road parking for 2 cars but plenty of room in lane at front of cottage for cars. Central heating for winter/early spring months. All bedlinen provided including bathtowels but guests MUST bring swimming towels. The walks from the cottages are wonderful in all weathers; the beautiful rugged coastline combines with a profusion of wild flowers, butterflies and birds in summer, and bracing winds and huge seas in winter. Hartland Quay with it’s hotel and superb cliff scenery, Hartland point and lighthouse, Hartland Abbey and Gardens and St. Nectan’s Church are all within walking distance; Clovelly, Welcombe and Morwenstow are slightly further, but well within a day’s walk. Hartland with its Post Office, general stores, interesting craftsmen, artists, woodworkers and potteries is also easily walkable. A little further away, Bradworthy has very good shops and is almost unchanged since the 1950s! Supermarkets at Bideford, Bude and Barnstaple are approx. 30 minutes away by car. There are many wonderful beaches within easy driving distance; there are houses and gardens open to the public, family attractions, excellent pubs and restaurants and, of course, tea rooms! Hartland Abbey has delicious cream teas. Boat trips can be taken to Lundy Island from Clovelly or Bideford. Bideford, Barnstaple and Bude are all within 30 minutes drive: Exmoor and Dartmoor are approx 1 hour’s drive. Junction 27 on the M5 is approximately 1½ hours. On receipt of a deposit of 25% of the weekly rent, your booking will be confirmed.The balance is due six weeks before the holiday commences, on receipt of which further details will be forwarded to you, together with a helpful list of local services. 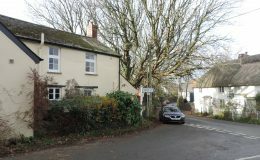 The cottage is let from Friday to Friday. Please arrive from 4pm and depart not later than 10.00am, in order for the cottage to be cleaned between lets. Tel: 01884 860225, 01237 441496.